Health Benefits of Bone Broth - Anti-Age Naturally! If you’ve been with me for a while you might remember that a few years ago my appendix burst. While I was in the hospital my nurse practitioner friend came to visit me and said, “we have to heal your gut with bone broth (and prebiotic and probiotics too)”. The way I was feeling I just groaned. “Make soup … Are you kidding?” I thought. (I may have said that out loud. I don’t really remember – was a fuzzy time). My recovery wasn’t short but I listened to my friend and obliged. She’s not scary but she can be tough. Since I was in so much pain, all I could do at the time was just boil bones. Nothing fancy. Salt to taste. I was willing to do anything to make the pain go away. But, as the weeks started to go by, my pain and very sore stomach started to feel better. I truly believe that the bone broth and pre and probiotics helped speed up my healing process. You might wonder why I’m telling you this. Well, as it turns out, bone broth has so many health benefits and it’s anti-aging! Woo-hoo, I love that!! And I truly feel that it helped me heal my gut and put some spring into my skin. And little popups give you different sizes, shots and flavors of broth for your health. And bone broth has been featured in places such as Bon Appetit, Shape Magazine, Food and Wine and even Gwyneth Paltrow’s Goop website. It’s truly everywhere, and for good reason. You see, bone broth can really help all because it’s nutrient-rich. It contains so many vitamins and minerals. Here are some: magnesium, silicon, calcium, phosphorus, Vitamin D, potassium, zinc, manganese, copper, boron, iron, Vitamin A, Vitamin K, Vitamin C, B vitamins, sulfur chondroitin, glucosamine, collagen, gelatin and amino acids, which are the building blocks of protein (bone broth is very high in protein). 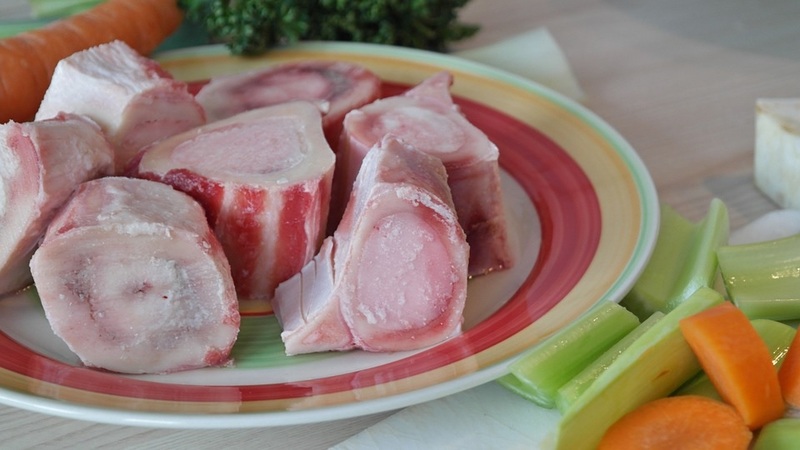 The most important thing when making bone broth is to only buy grass-fed beef bones or free-range organic chicken bones. The reason it’s important for you to get organic bones is that you don’t want to be eating soup which is made from bones that are full of antibiotics or hormones, or are from sick animals. If you can’t get organic bones then don’t do it. Because It’s important to get your bone broth from healthy, well-fed animals with all the nutrients and none of the bad elements. (But keep reading. If you can’t get organic bones, there are alternatives). Start with 3-4 lbs of organic bones. For chicken bone broth I use necks, back and feet because it yields a lot of collagen. For beef bone broth I use bones with marrow but I also like to throw in some oxtail and knuckle (the mixture of different bones makes it tastier). I put the bones in the biggest pot that I have, cover the bones with water and fill close to the top (it’s a little over four quarts). Loosely cover and simmer beef bones up to two days and chicken bones (because they disintegrate) for only 24 hours. You can stop there, of course, after adding some salt and pepper to taste. Or you can add onions, carrots, celery and garlic in the beginning with the bones. And some people add a couple of tablespoons of apple cider vinegar (ACV) because they say it pulls out the minerals. I don’t get hung up on that step. If I have the ACV I add it and if not I don’t. I have found that this recipe makes so much broth that I have to freeze some. And the easiest way to save the bone broth you can’t eat is to pour it into ice-cube trays. Freeze so they are ready to use when needed. Simple and easy. I’ll pop a couple of cubes out and heat for my daily bone-broth dosage. If you are a dog owner you’ll appreciate this – I now share my bone broth with my dog. You see, a year and a half ago he started coughing. I took him to the vet and he was diagnosed with congestive heart failure. I immediately started him on bone broth because it’s good for the heart. You should see this little puppy of mine running around like nothing now. And boy do his ears perk up when I say, “broth”. I’ve done other things for him too and I’ve written about them as well. Click HERE to read more about my dog, Chance. After drinking my bone broth daily, like the good nurse told me to, I soon tired of it. Even the smell, when cooking, made me a little queasy. So, I decided to search out some alternatives and found a company, Kettle and Fire, that makes tomato soup from organic bone broth. I was hesitant at first because I was a Campbell’s tomato soup kid. But since they had a money-back guarantee, and I needed an alternative, I ordered the bone broth tomato soup. And, to my surprise, I thought it was better than Campbell’s. So for today’s article I reached out to brothers Nick and Justin Mares, owners and creators of Kettle and Fire, to see if they could offer you a deal. That’s an incredible savings. But there’s more. In that same offer you will see that they also are giving 20% off of their Summer Squash bone broth. So if you don’t have time to make your own bone broth, or don’t have access to organic bones, you can also find organic chicken and beef broth through Kettle and Fire. But it doesn’t stop there. They also have two more soup flavors made with organic bone broth – Mushroom and Miso. And the best part is that you don’t have to do anything with Kettle and Fire’s soups – you can just heat them up. Or, if you want, you can use them as a soup/stew starter and make them as hearty as you want. Now I haven’t tried the mushroom soup yet … but, I can tell you the Miso Soup is amazing. barley, shiitake, maitake and reishi mushrooms. Now the only hitch with this special offer from Kettle and Fire is that it’s only good for five days. So if you don’t order by May 10, 2018 your price will be the normal price (still an amazing deal so you don’t have to get the organic bones and make it yourself). Click HERE to order the tomato or squash soup. And click HERE to check out Kettle and Fires other soups. Make your own bone broth or buy premade bone broth. Either way get some and enjoy – for your good health! Zheng Y., Et. al. Probiotic Properties of Lactobacillus Strains Isolated from Tibetan Kefir Grains. PLoS One. 2013. Rapin JR., Et. al. Possible Links between Intestinal Permeablity and Food Processing: A Potential Therapeutic Niche for Glutamine. Clinics. 2010. Rao RK., Et. al. Role of Glutamine in Protection of Intestinal Epithelial Tight Junctions. J Epithel Biol Pharmacol. 2015. Tarig M., Et. al. Studies on the antisecretory, gastric anti-ulcer and cytoprotective properties of glycine. Res Commun Mol Pathol Pharmacol. 1997. Clark KL., Et. al. 24-Week study on the use of collagen hydrolysate as a dietary supplement in athletes with activity-related joint pain. Curr Med Res Opin. 2008. Selhub EM., Et. al. Fermented foods, microbiota, and mental health: ancient practice meets nutritional psychiatry. J Physiol Anthropol. 2014. Bowe WP., Et. al. Acne vulgaris, probiotics and the gut-brain-skin axis – back to the future? Gut Pathog. 2011. Rapin JR., Et.. al. Possible Links between Intestinal Permeablity and Food Processing: A Potential Therapeutic Niche for Glutamine. Cllinics. 2010. Kaayla Daniel. Why Broth is Beautiful: Essential Roles for Proline, Glycine and Gelatin. Weston A Price Foundation. 2003. Picard D., Et. al. Incidence and risk factors for striae gravidarum. JAAD. 2015. Ganceviicience R., Et. al. Skin anti-aging strategies. Dermatoendrocrinol. 2012. Carrillo A. Why Does Your Skin Age? Dartmouth Undergraduate Journal of Science. 2013. Kennedy DO., Et. al. Multivitamins and minerals modulate whole-body energy metabolism and cerebral blood-flow during cognitive task performance: a double-blind, randomised, placebo-controlled trial. Nutr Metab. 2016. Vivek Kumar Dey. Misuse of topical corticosteroids: A clinical study of adverse effects. Indian Dermatol Online J. 2014. Rennard BO, Et. al. Chicken soup inhibits neutrophil chemotaxis in vitro. Pulmonary and Critical Care Medicine Section, Nebraska Medical Center, Omaha, NE, USA. 2000. McCance RA., Et. al. Bone and vegetable broth. BMJ Archives of Disease in Childhood. 1934. Zulli F., Et. al. Improving skin function with CM-glucan, a biological response modifier from yeast. Int J Cosmet Sci. 1998. Celina MP., Et. al. Anti Inflammatory, antioxidant and cytotoxic actions of β-glucan-rich extract from Geastrum saccatum mushroom. Science Direct. 2007. Majtan J., Et. al. β-Glucans: Multi-Functional Modulator of Wound Healing. Molecules. April 2018. Cloetens L., Et. al. Role of dietary beta-glucans in the prevention of the metabolic syndrome. Nutr. Rev. 2012. Daou C., Et. al. Oat Beta‐Glucan: Its Role in Health Promotion and Prevention of Diseases. Institute of Food Technologists. 2012. Chen J., Et. al. Beta-glucans in the treatment of diabetes and associated cardiovascular risks. Vas Health Risk Manag. 2008. Rop O., Et. al. Beta-glucans in higher fungi and their health effects. Nutr Rev. 2009. Talbott SM., Et. al. Baker’s yeast beta-glucan supplement reduces upper respiratory symptoms and improves mood state in stressed women. J AM Coll Nutr. 2012.